Sister Charlyne is extremely grateful for her Hawaiian lineage through her paternal great grandmother who was full-blooded Polynesian. Her parents, Marion Fisher Brown and Charles Hingley Brown, raised her on Oahu in a rural area steeped in ethnic diversity and culture. She is also grateful she was educated by both the Carondelet and the Maryknoll Sisters in Hawaii. Education by Holy Names Sisters at Fort Wright College of the Holy Names, Spokane, further enriched Charlyne as she pursued a teaching career and received both bachelor and master degrees there. Through those SNJMs who were her housemothers, mentors and friends, she began to feel called by God to consider a religious vocation. After teaching one year in Hawaii, Charlyne entered the Holy Names novitiate at Marylhurst, Oregon. 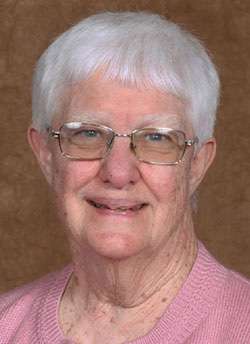 Charlyne taught in parochial schools in Everett, Tacoma, Seattle and Spokane for over 30 years. After a health sabbatical, she spent 17 years at Holy Names Academy (HNA), Seattle, as a teacher and as part of the Campus Ministry and Community (CMC) team, engaging her passion for service and social justice. This included service trips to Uganda, Lesotho and Kenya. Within the United States, Charlyne took students to participate in Holy Names ministries in Jonestown, Mississippi, and for eight years she traveled with teenagers to New Orleans to help rebuild homes destroyed because of the devastation of Hurricane Katrina. At the first SNJM Justice and Peace Youth forum, held in Winnipeg, Manitoba, Charlyne was mentor for four HNA young women. This first Youth Forum was so beneficial that the HNA students strongly advocated sponsoring the second Forum, and Charlyne was one of its five major planners, including the memorable closing ritual in the Academy Library with students from every SNJM secondary school participating. In 2014, Charlyne accepted an invitation to move to Toppenish, Washington, and currently teaches ESL classes at Nuestra Casa in Sunnyside.